Have you read a book lately? Can you relate to one of the characters in the story? In what way? Do you think alike? Do you think alike? Do you dress alike? Do you act alike? What makes you think that you are different than the character in the story? What makes you think you are like the character in the story? 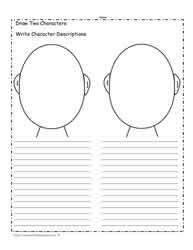 This graphic organizer requires you to compare yourself with a character. It could be a character from a book or a movie. However, be sure to think socially, physically, emotionally and intellectually when you are comparing yourself with another. If you find this worksheet helpful, be sure to share with a fellow educator. Spring is in the air and if you haven't checked out the spring worksheets, you'll find them all right here. I'm off to determine which actor or book character I'm most like. Have a great week educators!